Shouldn't चाहिएं (i.e. with a nasalized final vowel) also be allowed? I seem to recall that it can optionally inflect for plural subjects. 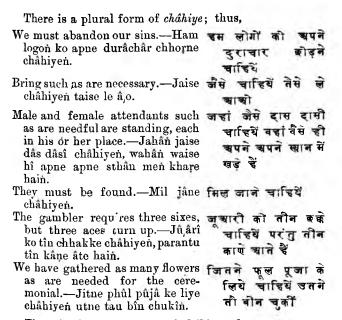 It does seem intuitive, but चाहिए is unique in that it doesn't have a distinct plural form. Frederic Pincott's admittedly rather old "The Hindi Manual" disagrees: . After spending a bit of time googling, it seems that there is disagreement on this matter and a number of speakers assert that nasalizing the plural is incorrect. I do feel that it is a variant that at least exists (though I cannot claim that it is correct or not), as I learned it in university and I'm pretty sure my ex, who was an Urdu speaker, used it. Whether it should be accepted here in Duolingo is another matter and perhaps it is best that it was omitted, for simplicity's sake. That's interesting. Looks like it's rather commonly used in Urdu. Google turns up quite a few results for چاہئیں (chaahiyen). But I have never heard or read the plural form in Hindi. My guess is that it was in use when Hindustani was a more homogenised language and its use declined in what eventually became the Modern Hindi register.